So, in swinging into the spirit of the occasion of The Dickens Festival, I stayed at The Gordon Hotel, right on the main drag of Rochester where the Dickens parade takes place on the Saturday morning. The evening before the parade, while dining in the very Victorian-like setting of the hotel lounge bar with its ornate leather chairs, I happened to look up and see what looked like two ghosts haunting the establishment. 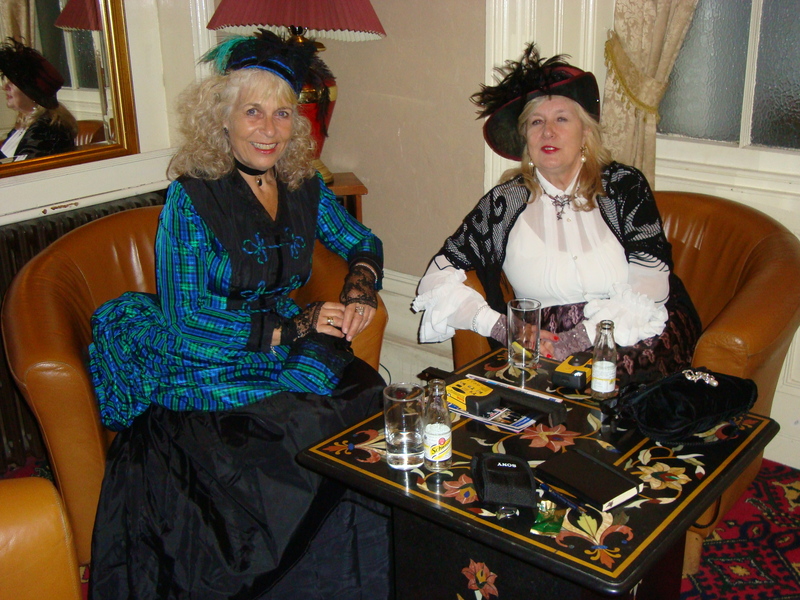 For there across from me were two ladies dressed up in full flowing skirts and frills that fit with the times that Dickens himself haunted with his tales like “A Christmas Carol” and “Pickwick Papers”. 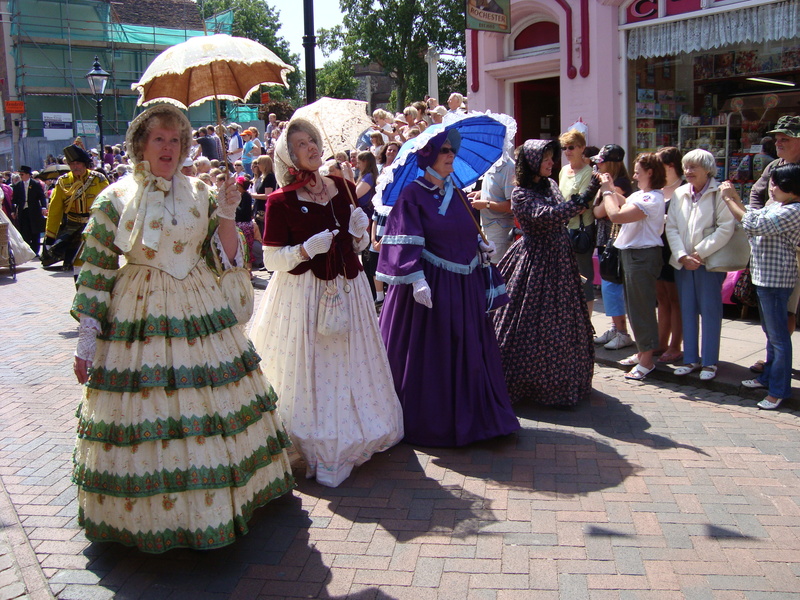 Sandra and Audrey were there for the parade and had taken part in promenades along the road that Friday. It was one of those things that sometimes happens, when you meet people and quickly establish rapport, that you find yourself discussing things that lead to you believing you can solve the world’s problems. That was the sort of conversation I had with these two amazing ladies over the course of a few hours, and covering subjects ranging from independence and evolution to past lives and spiritual healing. It began with Sandra, the teacher/librarian, and her concern that the kids of today have no incentive to learn as there are no jobs to go to, yet so many fascinating things to be learned – such as the relationship between algae and plankton as well as why certain whales have only evolved to eat those and not big fish, as well as knowing anything more about The Titanic than it “being a big boat that sank” – but somehow needing the motivation to learn these things. It ended with Audrey, the spiritual healer, helping people interprete dreams about running away from a vacuum cleaner and how incredible it was that there were (and perhaps still are) cultures that believed/believe that the Earth stood on four elephants – yet digressing into telling me about two past lives I have had, and being reluctant to come back into this one. Interestingly enough though, without knowing too much about what I am trying to write about, Audrey told me how in one of my past lives I held an important place at court – though was not a leading figure…. It was at that point I wondered whether anyone else could see the two ladies I was now chatting to in the corner – or whether I was now just the crazy man in the lounge bar talking to himself after three double shots of Jamieson’s whiskey. Spirits like that can raise or erase the spirits – just like I found they did with my stay at the start of the journey. However, once again, I noted that it is only when I have accidentally found my way OFF the beaten track that I meet these colourful characters. For it turned out, as I left the next day, that there was good reason why pilgrims would not have come to Rochester – and why it may now be hard to get away from there to Canterbury in the present day as a result of that history. This entry was posted in Rochester and tagged after life, Charles Dickens, ghosts, past lives, second life, spiritual. Bookmark the permalink.